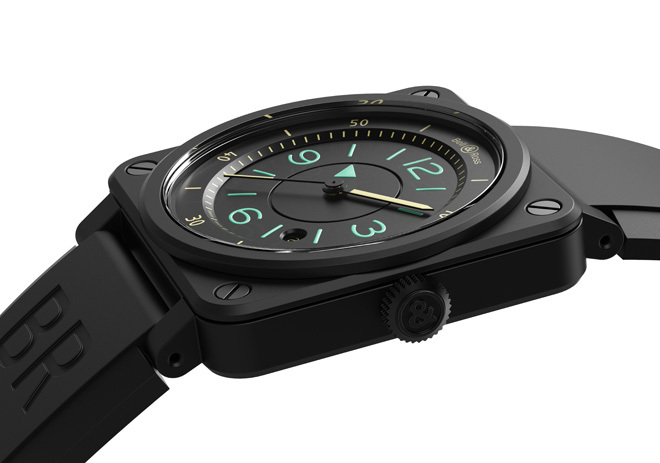 Taking inspiration from analog aircraft instrumentation since inception, Bell & Ross goes one step further with the new Baselworld 2019 BR 03-92 Bi-Compass novelty making substantial improvements to precision, legibility, and performance. 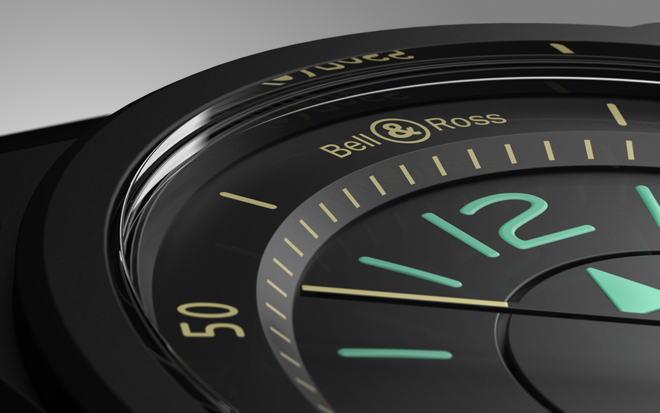 The new Bell & Ross BR 03-92 Bi-Compass recreates the graphic style of cockpit navigation instruments with an alternative approach, eschewing the traditional hour hand for an ultra-light hour disc. 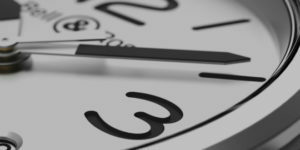 Generally speaking, a traditional timepiece features all three hands, hours, minutes and seconds anchored at the centre of the watch, through a central pinion. While the Baselworld 2019 Bell & Ross BR 03-92 Bi-Compass follows this convention, its execution in terms of design conveys the feel and precision of a regulator model within the aesthetic codes of the BR 03 series. 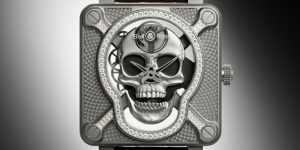 The origin of the regulator watch arose from necessity. Watchmakers would “regulate” (hence the name) watches by watching an already functional timepiece, paying close attention to the minute hand and then adjust the time accordingly on their watch-in-progress. This meant that the minute hand became of paramount importance and a specialised genre of regulator watches were created as a result. 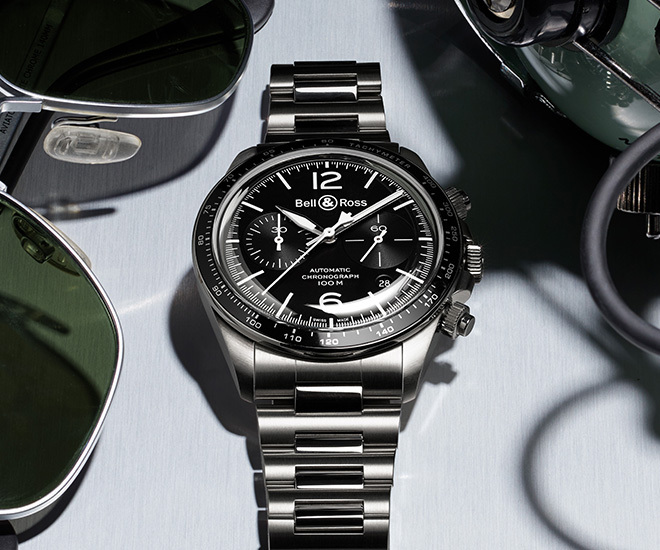 In time, these specialised watches entered into widespread use for professions which also required minute-to-minute precision including railway conductors and WW2 weapon specialists conducting bomber runs, timing their journeys so as to ensure the way over precise co-ordinates of their targets. 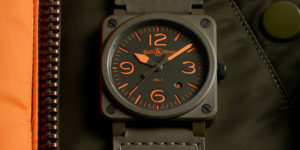 That said, while the BR 03-92 Bi-Compass is not a regulator watch per se, the design talents at Bell & Ross have managed to simplify the dial by concentrating visual focus on a singular minute hand via high contrast luminous paint, disguise the seconds hand in matt black similar to the dial and set the hour indicator upon an ultra-light disc – an ingenious application of design principles! The use of colour is important in aviation for the coding of signals, hence the need to set adequate color requirements to ensure that flight crew can recognize information at a glance. These Isonorm principles are followed in the new BR 03-92 Bi-Compass. The off white “coquille d’oeuf” hands and numerals on the dial unveil the minutes and seconds and echoes the legibility principles of professional aeronautical instruments commonly used on instruments, specifically on US Navy aircrafts. 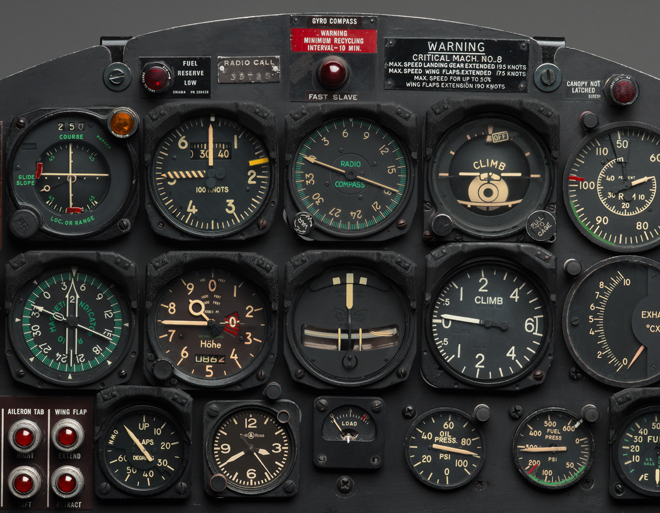 The clever division of indicators means that the 2019 Bell & Ross BR 03-92 Bi-Compass becomes effortless to read from a fighter pilot’s perspective, making minute to minute adjustments to flight paths and trajectories. For urban warriors, the matte black dial has hands, numerals and indexes of the new BR 03-92 Bi-Compass are interestingly organised. Each coated in a different hue of SuperLuminova, the dial is sub-divided into a main central area where the ultra-light hour disc resides and an outer periphery where the minute track is featured – through a small “step” equipped with a minute-circle. 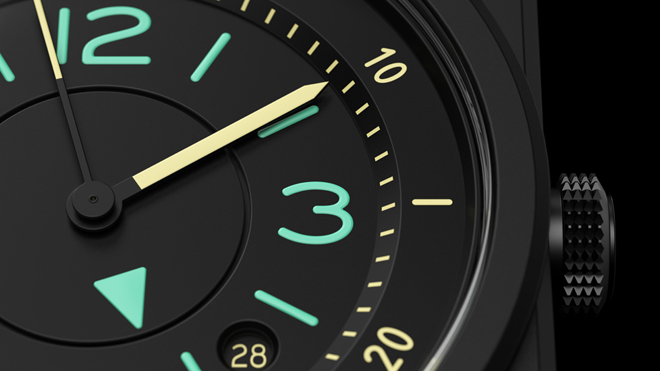 To enhance legibility on the latest BR 03-92, the hour and minute graduations have been separated to promote the minutes on the main dial as in original instruments while the hours are displayed in the center while the hour reading is indicated by a green triangle marker. 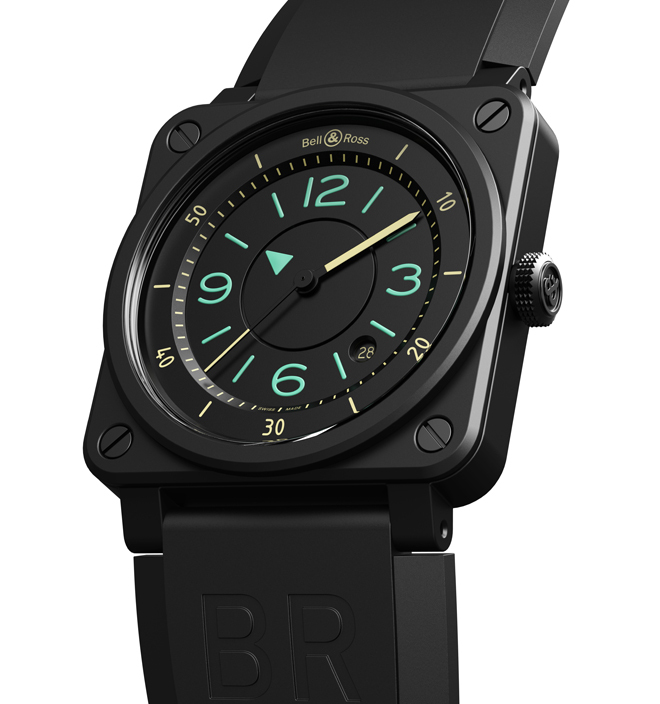 The BR 03-92 utilises an ultra-light disc for hour indication to ensure that the power reserve or chronometry of the timepiece is not affected. That said, using a disc as an indicator means that deformation would increase friction co-efficient thereby increasing power requirements or worse, jam completely, so Bell & Ross had to ensure adjustment to the nearest micron ensuring that the disc is constantly parallel. 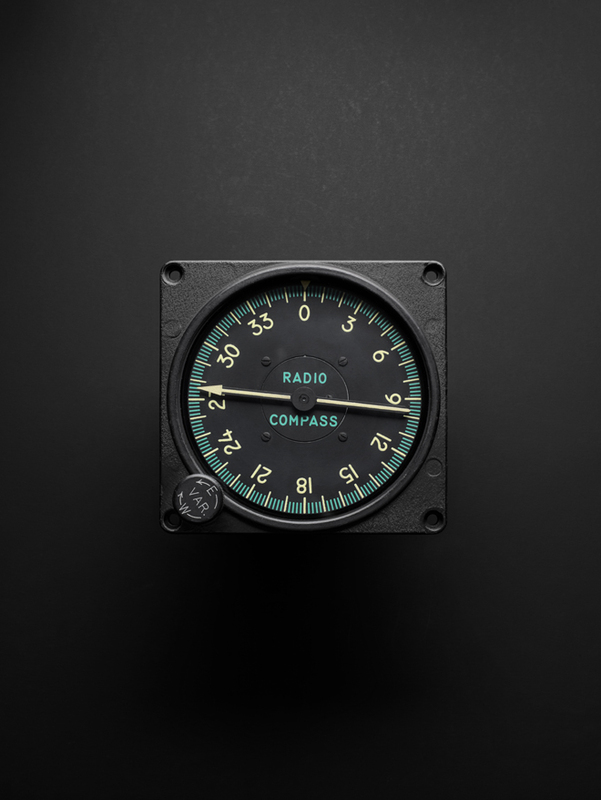 Deepening the association with cockpit instrumentation is the fact that the font of the new BR 03-92 Bi-Compass follows Isonorm standards where the typography used for the numerals is identical to that on analog aviation counters. 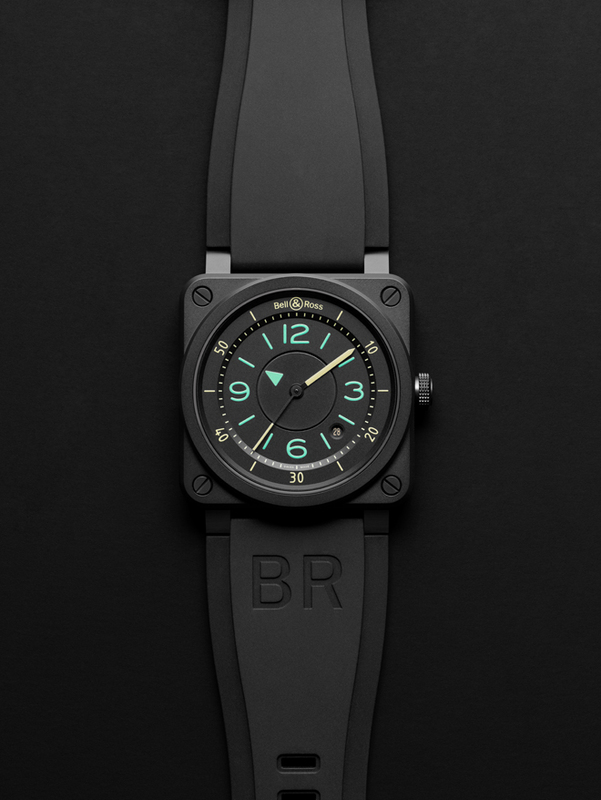 New Bell & Ross BR03-92 MA-1 – It’s like a Flight Jacket for the Wrist!